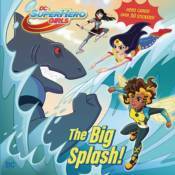 The DC Super Hero Girls have to save the sea from the sharp-toothed villain King Shark in this action-packed book! Wonder Woman, Batgirl, Bumblebee, and Katana face the King Shark in a battle for the high seas. Can Katana overcome her fear of deep water to save the day? Find out in this action-packed book that also features over 30 stickers and trading cards of your favorite DC Super Hero Girls.